It was formed by the Government of Quebec in 1944 from the expropriation of private firms. This was followed by massive investment in hydro-electric projects like Churchill Falls and the James Bay Project. Today, with 63 hydroelectric power stations, the combined output capacity is 36,912 megawatts. Extra power is exported from the province and Hydro-Québec supplies 10 per cent of New England's power requirements. Hydro-Québec is a state-owned enterprise based in Montreal. In 2015, it paid CAD$2.36 billion in dividends to its sole shareholder, the Government of Québec. Its residential power rates are among the lowest in North America. More than 40 percent of Canada’s water resources are in Québec and Hydro-Québec is the fourth largest hydropower producer in the world. The company logo, a stylized "Q" fashioned out of a circle and a lightning bolt, was designed by Montreal-based design agency Gagnon/Valkus in 1960. In Quebec, advocates for the creation of a public hydroelectric utility protested against high costs, poor rural electrification, and the lack of French speakers in management positions in hydroelectricity companies. In 1944, Montreal Light, Heat & Power company was nationalised, along with its subsidiary, Beauharnois Power, and Hydro-Québec was created to manage the companies. Quebec Premier Adélard Godbout adopted a policy of investing 10 million dollars per year in rural electrification. However, in 1944 the government changed, and the new premier Maurice Duplessis was opposed to any form of government intervention in the economy. Local cooperatives were created to bring power to rural areas. Duplessis remained in power until 1960, and during that time there were no further nationalisations of companies, and Hydro-Québec mostly served the Montreal area. Beauharnois Hydroelectric Generating Station completed in 1961, 1,903 MW. Between 1944 and 1962, Hydro-Québec's installed capacity increased from 616 to 3,661 MW while lowering residential power rates by half in the Montreal area. The spillway at the Robert-Bourassa generating station can deal with a water flow twice as large as the Saint Lawrence River. Inaugurated in 1979 the 5,616 MW generating station was at the heart of a network of 8 hydroelectric stations known as the James Bay Project. Manicougan-Outardes Project, a 7-dam hydroelectric complex including the Jean-Lesage generating station (1,145 MW), René-Lévesque generating station (1,244 MW), and the Daniel-Johnson Dam (2,596 MW), originally named Manic-2, Manic-3, and Manic-5 respectively. Because these stations were 700 kilometres away from the urban centres in southern Quebec, through transmission line voltage was stepped up to 735 kV for the first time anywhere, led by engineer Jean-Jacques Archambault. Churchill Falls Generating Station, 5,428 MW. 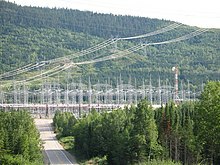 The station is in Labrador and the government of Quebec negotiated a contract where Hydro-Québec buys power from the project at 1969 prices until the year 2041. That contract has been a source of conflict between the two provinces. Phase I of the James Bay Project. Hydro-Québec worked with Atomic Energy of Canada Limited to build the CANDU reactor equipped Gentilly Nuclear Generating Station, which closed in 2012. Because of the economic climate, demand for electricity dropped significantly in the early 1980s, which led to structural changes at Hydro-Québec. It became a joint stock company whose sole shareholder is Government of Québec, to which it pays an annual dividend. It was also given the mandate to export power and to work in any energy-related field. In 1986 the Quebec – New England Transmission began bringing power from the James Bay Project 1,100 kilometers south to the Boston area. Phase II of the James Bay Project started in 1987 and took nine years to complete. Construction of the Denis-Perron Dam began in 1994. Like its counterparts in the North American utility industry, Hydro-Québec was reorganized in the late 1990s to comply with electricity deregulation in the United States. The transmission division, TransÉnergie, was the first to be spun off in 1997, in response to the U.S. Federal Energy Regulatory Commission's publication of Order 888. In the same year, the U.S. Federal Energy Regulatory Commission granted Hydro-Québec a licence to sell wholesale electricity at market prices, enabling Hydro-Québec to expand its market. Hydro-Québec also acquired a substantial share of Noverco, controller of natural gas distributor Gaz Métro, to participate in that market in northeastern North America. the Rupert River diversion will channel part of the natural flow of the river (orange on the map) to the Robert-Bourassa Reservoir. In 2002 the Agreement Respecting a New Relationship Between the Cree Nation and the Government of Quebec between the Grand Council of the Crees and the Quebec government made possible the development of the Eastmain Reservoir. The Eastmain-1-A and Sarcelle powerhouses and Rupert River diversion project were completed at a cost of $5,000 million CAD. This will provide water power to the turbines at Eastmain-1, Eastmain-1-A and Sarcelle powerhouses and will provide increased flow at the existing La Grande-1 generating station as well as Robert-Bourassa and the La Grande-2-A generator stations. Output will be 918 MW. Sainte-Marguerite-3 in 2003, 882 MW. Péribonka in 2008, 385 MW. Rocher-de-Grand-Mère in 2004, 230 MW. Eastmain-1 in 2007, 519 MW. Rapide-des-Cœurs in 2009, 76 MW. Mercier in 2009, 55 MW. Eastmain-1A in 2012, 750 MW. La Sarcelle in 2013, 159 MW. Romaine-2 in 2014, 640 MW. Romaine-1 in 2015, 270 MW. Romaine-3 in 2017, 395 MW. Romaine-4 scheduled to be completed before 2020, 245 MW. In 1988, all of Quebec and parts of New England and New Brunswick lost power because of an equipment failure at a substation on the North Shore. The March 1989 geomagnetic storm tripped circuit breakers on the transmission network causing a nine-hour Quebec-wide blackout. In the North American ice storm of 1998, five days of freezing rain collapsed 600 kilometres (370 mi) of high voltage power lines and over 3,000 kilometres (1,900 mi) of medium and low voltage distribution lines in southern Quebec. Up to 1.4 million customers were without power for up to five weeks. Hydro-Québec generation and main transmission network, as of 2008. Hydro-Québec has created separate business units dealing with the generation, transmission, distribution and construction. In 2017, production division generated 1.9B $ of net income (68.4%), transmission division 0.55B$ (19.4%), distribution division 0.33B $ (11.7%), and construction division did not generate any income. Hydro-Quebec redistributes all profits back to the government. In 2017, the crown corporation contributed $4 billion to the Quebec government by means of net income ($2.8B), royalties ($0.7B), public utilities tax ($0.3B) and debt securities ($0.2B). In the year 2000 with the adoption of Bill 116, which amended the Act respecting the Régie de l'énergie, to enact the functional separation of Hydro-Québec's various business units. Legislation passed in 2000 commits the generation division, Hydro-Québec Production, to provide the distribution division, Hydro-Québec Distribution, a yearly heritage pool of up to 165 TWh of energy plus ancillary services—including an extra 13.9 TWh for losses and a guaranteed peak capacity of 34,342 MW—at a set price of 2.79¢ per kWh. Order in council 1277-2001 specifies quantities to be delivered for each of the 8,760 hourly intervals, which vary from 11,420 to 34,342 MW. According to the 2017 annual report the workforce stood at 19,786 employees, both permanent and temporary workers. And, a total of 1,304 employees were hired. For the year ending on December 31, 2017, Hydro-Québec recorded revenues of $13.4 billion. An increase of 0.97%. (Year-To-Date) Hydro-Quebec has assets of $75.73 billion. Net income was $2.84 billion, decreasing by $20 million. This decrease in profit was attributed to a new earning-sharing mechanism (ESM), an agreement between Hydro-Quebec and the Régie de l'Énergie. The sole purpose of the deal is to share earnings with Quebec residents only if the return-on-equity (ROE) exceeds the authorised (ROE) level. Furthermore, the profit margin was 21.1%. The crown corporation was able to self-financing at a 66.6% rate, meaning that it was able to generate near two-thirds of all cash needed to finance operations from its income. Total expenditures amounted to $8.1 billion in 2017 are were made of electricity and fuel purchases ($2B), depreciation on property, plant and equipment ($2.69B), taxes ($1.07B) and financial expenses ($2.5B). Hydro-Quebec is credit-rated by Moody's, Standard & Poor and Fitch Ratings. The ratings of the issued long-term debt, or bonds, were AA2, AA- and AA- respectively. In 2017, Hydro-Quebec issued $1.2 billion of long-term bonds to the Quebec Government. Also, dividends payable, or cash payouts paid to the Quebec's government, totalled $2.13 billion in 2017. In 1981, the Parti Québécois government redefined Hydro-Québec's mission by modifying the terms of the social pact of 1944. The government issued itself 43,741,090 shares worth C$100 each, and the amended statute stated that Hydro-Québec would now pay up to 75% of its net earnings in dividends. This amendment to the Hydro-Québec Act started an episodic debate on whether Hydro-Québec should be fully or partially privatized. In recent years, economist Marcel Boyer and businessman Claude Garcia—both associated with the conservative think tank The Montreal Economic Institute—have often raised the issue, claiming that the company could be better managed by the private sector and that the proceeds from a sale would lower public debt. Without going as far as Boyer and Garcia, Mario Dumont, the head of the Action démocratique du Québec, briefly discussed the possibility of selling a minority stake of Hydro-Québec during the 2008 election campaign. A Léger Marketing poll conducted in November 2008 found that a majority of Quebec respondents (53%) were opposed to his proposal to sell 7.5% of the company's equity to Quebec citizens and businesses, while 38% were in favor. Commenting on the issue on Guy A. Lepage's talk show, former PQ Premier Jacques Parizeau estimated that such an idea would be quite unpopular in public opinion, adding that Hydro-Québec is often seen by Quebecers as a national success story and a source of pride. This could explain why various privatization proposals in the past have received little public attention. The liberal government has repeatedly stated that Hydro-Québec is not for sale. Like many other economists, Yvan Allaire, from Montreal's Hautes études commerciales business school, advocate increased electricity rates as a way to increase the government's annual dividend without resorting to privatization. Others, like columnist Bertrand Tremblay of Saguenay's Le Quotidien, claim that privatization would signal a drift to the days when Quebec's natural resources were sold in bulk to foreigners at ridiculously low prices. "For too long, Tremblay writes, Quebec was somewhat of a banana republic, almost giving away its forestry and water resources. In turn, those foreign interests were exporting our jobs associated with the development of our natural resources with the complicity of local vultures". Left-wing academics, such as UQAM's Léo-Paul Lauzon and Gabriel Sainte-Marie, have claimed that privatization would be done at the expense of residential customers, who would pay much higher rates. They say that privatization would also be a betrayal of the social pact between the people and its government, and that the province would be short-selling itself by divesting of a choice asset for a minimal short term gain. The Daniel-Johnson Dam on the Manicouagan River, supplying the Manic-5 hydro plant. On December 31, 2013, Hydro-Québec Production owned and operated 61 hydro plants—including 12 of over a 1,000 MW capacity— 26 major reservoirs. These facilities are located in 13 of Quebec's 430 watersheds, including the Saint Lawrence, Betsiamites, La Grande, Manicouagan, Ottawa, Outardes, and Saint-Maurice rivers. These plants provide the bulk of electricity generated and sold by the company. Non-hydro plants included the baseload 675-MW gross Gentilly nuclear generating station, a CANDU-design reactor which was permanently shut down on December 28, 2012 the 660-MW Tracy Thermal Generating Station, a heavy fuel oil-fired plant shutdown in March 2011 and two gas turbine peaker plants, for a total installed capacity of 36,971 MW in 2011. Hydro-Québec's average generation cost was 2.11 cents per kWh in 2011. The company also purchases the bulk of the output of the 5,428-MW Churchill Falls generating station in Labrador, under a long term contract expiring in 2041. In 2009, Hydro-Québec bought the 60% stake owned by AbitibiBowater in the McCormick plant (335 MW), located at the mouth of the Manicouagan River near Baie-Comeau, for C$616 million. In 2013, the energy sold by Hydro-Québec to its grid-connected customers in Quebec and exported to neighboring markets came almost exclusively from renewable sources. Hydro (96.78%) is by far the largest source, followed by wind (2.16%) and biomass, biogas and waste (0.75%). The remainder came from nuclear (0.19%) and thermal (0.12%) generation. Emissions of carbon dioxide (1,130 tonnes/TWh), sulfur dioxide (4 tonnes/TWh) and nitrogen oxides (10 tonnes/TWh) were between 49 and 238 times lower than the industry average in northeastern North America. Imported electricity bought on the markets account for most of these emissions. The Micoua substation on the North Shore of Quebec. This facility converts 315 kV power coming from five hydro plant to 735 kV. This TransÉnergie facility is one of the main nodes of the 11,422-kilometre (7,097 mi) long 735 kV network. Hydro-Québec's expertise at building and operating a very high voltage electrical grid spreading over long distances has long been recognized in the electrical industry. TransÉnergie, Hydro-Québec's transmission division, operates the largest electricity transmission network in North America. It acts as the independent system operator and reliability coordinator for the Québec interconnection of the North American Electric Reliability Corporation system, and is part of the Northeast Power Coordinating Council (NPCC). TransÉnergie manages the flow of energy on the Quebec network and ensures non-discriminatory access to all participants involved in the wholesale market. The non-discriminatory access policy allows a company such as Nalcor to sell some of its share of power from Churchill Falls on the open market in the State of New York using TransÉnergie's network, upon payment of a transmission fee. In recent years, TransÉnergie's Contrôle des mouvements d'énergie (CMÉ) unit has been acting as the reliability coordinator of the bulk electricity network for Quebec as a whole, under a bilateral agreement between the Régie de l'énergie du Québec and the Federal Energy Regulatory Commission of the United States. TransÉnergie's high voltage network stretches over 33,630 km (20,900 mi), including 11,422 km (7,097 mi) of 765 and 735 kV lines, and a network of 514 substations. It is connected to neighbouring Canadian provinces and the United States by 17 ties, with a maximum reception capacity of 10,850 MW[note 2] and a maximum transmission capacity of 7,994 MW. A rectifier at the Outaouais substation, located in L'Ange-Gardien. The 1,250 MW back-to-back HVDC tie links the Quebec grid with Ontario's Hydro One network. The TransÉnergie's network operates asynchronously from that of its neighbours on the Eastern Interconnection. Although Quebec uses the same 60 hertz frequency as the rest of North America, its grid does not use the same phase as surrounding networks. TransÉnergie mainly relies on back to back HVDC converters to export or import electricity from other jurisdictions. This feature of the Quebec network allowed Hydro-Québec to remain unscathed during the Northeast Blackout of August 14, 2003, with the exception of 5 hydro plants on the Ottawa River radially connected to the Ontario grid at the time. A new 1250-MW back to back HVDC tie has been commissioned at the Outaouais substation, in L'Ange-Gardien, near the Ontario border. The new interconnection has been online since 2009 and the 315 kV line is fully operational since 2010. One drawback of the TransÉnergie network involves the long distances separating the generation sites and the main consumer markets. For instance, the Radisson substation links the James Bay project plants to the Nicolet station near Sainte-Eulalie, south of the Saint Lawrence, over 1,200 kilometres (750 mi) away. In 2011, TransÉnergie invested C$1.3 billion in capital expenditures, including C$460 million to expand its network. In addition to the new tie with Ontario, the company plans to build a new 1200-MW direct current link between the Des Cantons substation at Windsor, Quebec in Quebec's Eastern Townships and Deerfield, New Hampshire, with an HVDC converter terminal built at Franklin, New Hampshire. The US segment of the US$1.1 billion line, would be built by Northern Pass Transmission LLC, a partnership between Northeast Utilities (75%) and NSTAR (25%). In order to go ahead, the project must receive regulatory approval in Quebec and the United States. The proposed transmission line could be in operation in 2015. According to Jim Robb, a senior executive from Northeast Utilities, New England could meet one third of its Regional Greenhouse Gas Initiative commitments with the hydropower coming through this new power line alone. An Hydro-Québec employee carries out the replacement of an underground transformer in Montreal. Hydro-Québec Distribution is in charge of retail sales to most customers in Quebec. It operates a network of 112,089 kilometres (69,649 mi) of medium and low voltage lines. The division is the sole electric distributor across the province, with the exception of 9 municipal distribution networks — in Alma, Amos, Baie-Comeau, Coaticook, Joliette, Magog, Saguenay, Sherbrooke and Westmount—and the electric cooperative of Saint-Jean-Baptiste de Rouville. Hydro-Québec Distribution buys most of its power from the 165-TWh heritage pool provided by Hydro-Québec Production at 2.79¢/kWh. The division usually purchases additional power by entering into long-term contracts after a public call for tenders. For shorter term needs, it also buys power from the neighboring systems at market prices. As a last resort, Hydro-Québec Production can also provide short-term relief. Supply contracts above and beyond the heritage pool must be approved by the Régie de l'énergie du Québec and their costs are passed on to customers. The division signed one natural gas cogeneration agreement for 507 MW in 2003, three forest biomass deals (47.5 MW) in 2004 and 2005, and ten contracts for wind power (2,994 MW) in 2005 and 2008, all with private sector producers. It also signed two flexible contracts with Hydro-Québec Production (600 MW) in 2002. Hydro-Québec Distribution is also responsible for the production of power in remote communities not connected to the main power grid. The division operates an off-grid hydroelectric dam serving communities on the Lower North Shore and 23 small diesel power plants in the Magdalen Islands, in Haute-Mauricie and in Nunavik. The TM4 electric engine was developed by Hydro-Québec. Hydro-Québec operates the Electric Circuit, the largest EV charging network in Quebec and Eastern Ontario. Hydro-Québec has made significant investments in research and development over the past 40 years. In addition to funding university research, the company is the only electric utility in North America to operate its own large-scale research institute, L'Institut de recherche d'Hydro-Québec (IREQ). Established by Lionel Boulet in 1967, the research centre is located in Varennes, a suburb on the South Shore of Montreal. IREQ operates on an annual research budget of approximately C$100 million and specializes in the areas of high voltage, mechanics and thermomechanics, network simulations and calibration. Research conducted by scientists and engineers at IREQ has helped to extend the life of dams, improve water turbine performance, automate network management and increase the transmission capacity of high voltage power lines. Another research centre, the Laboratoire des technologies de l'énergie (LTE) in Shawinigan, was opened in 1988 to adapt and develop new products while helping industrial customers improve their energy efficiency. In the last 20 years, the institute has also conducted research and development work towards the electrification of ground transportation. Current projects include battery materials, including innovative work on lithium iron phosphate and nano-titanate, improved electric drive trains and the effects of the large-scale deployment of electric vehicles on the power grid. Projects focus on technologies to increase range, improve performance in cold weather and reduce charging time. Hydro-Québec has been criticized for not having taken advantage of some of its innovations. An electric wheel motor concept that struck a chord with Quebecers, first prototyped in 1994 by Pierre Couture, an engineer and physicist working at IREQ, is one of these. The heir to the Couture wheel motor is now marketed by TM4 Electrodynamic Systems, a spin-off established in 1998 that has made deals with France's Dassault and Heuliez to develop an electric car, the Cleanova, of which prototypes were built in 2006. Hydro-Québec announced in early 2009 at the Montreal International Auto Show that its engine had been chosen by Tata Motors to equip a demonstration version of its Indica model, which will be road tested in Norway. The Hydro-Québec Équipement division acts as the company's main contractor on major construction sites, with the exception of work conducted on the territory covered by the James Bay and Northern Quebec Agreement, which are assigned to the Société d'énergie de la Baie James subsidiary. The construction of a complex of four hydroelectric generating stations on the Romaine River (1,550 MW) began on May 13, 2009. The plants are scheduled to be built and commissioned between 2014 and 2020. In his March 2009 inaugural speech, Quebec Premier Jean Charest announced that his government intends to further develop the province's hydroelectric potential. The call for further development of hydroelectric and other renewable generating capacity has been implemented in the company's 2009-2013 strategic plan, released on July 30, 2009. Hydro-Québec plans capacity upgrades at the Jean-Lesage (120 MW) and René-Lévesque (210 MW) stations and a third unit at the SM-3 plant (440 MW). The company will also conduct technical and environmental studies and undertake consultations with local communities to build new facilities on the Petit-Mécatina (1,200 MW) and Magpie (850 MW) rivers on the North Shore, and revive the Tabaret project (132 MW) in the Abitibi-Témiscamingue region, in western Quebec. Hydro-Québec first forays outside its borders began in 1978. A new subsidiary, Hydro-Québec International, was created to market the company's know-how abroad in the fields of distribution, generation and transmission of electricity. The new venture leveraged the existing pool of expertise in the parent company. During the next 25 years, Hydro-Québec was particularly active abroad with investments in electricity transmission networks and generation: Transelec in Chile, the Cross Sound Cable in the United States, the Consorcio Transmantaro in Peru, Hidroelectrica Rio Lajas in Costa Rica, Murraylink in Australia and the Fortuna generating station in Panama. It briefly held a 17% share in SENELEC, Senegal's electric utility, when the Senegalese government decided to sell part of the company to a consortium led by the French company Elyo, a subsidiary of Group Suez Lyonnaise des Eaux, in 1999. The transaction was canceled in 2000 following the election of president Abdoulaye Wade. Also in 1999, Hydro-Québec International acquired a 20% stake in the Meiya Power Company in China for C$83 million. The company held this participation until July 2004. The company's expertise was sought by several hydroelectric developers throughout the world, including the Three Gorges Dam, where Hydro's employees trained Chinese engineers in the fields of management, finance and dams. Hydro-Québec gradually withdrew from the international business between 2003 and 2006, and sold off all of its foreign investments for a profit. Proceeds from these sales were paid to the government's Generations Fund, a trust fund set up by the province to alleviate the effect of public debt on future generations. The northern pike (Esox lucius) is more prevalent today in the Robert-Bourassa Reservoir than it was before the flooding of the reservoir. The increase of this population has been counterbalanced by a decline in the walleye (Stizostedion vitreum) population. The construction and operation of electric generation, transmission and distribution facilities has environmental effects and Hydro-Québec's activities are no exception. Hydroelectric development affects the natural environment where facilities are built and on the people living in the area. For instance, the development of new reservoirs increases the level of mercury in lakes and rivers, which works up the food chain. It temporarily increases the emission of greenhouse gases from reservoirs and contributes to shoreline erosion. In addition, hydroelectric facilities transform the human environment. They create new obstacles to navigation, flood traditional hunting and trapping grounds, force people to change their eating habits due to the elevated mercury content of some species of fish, destroy invaluable artifacts that would help trace the human presence on the territory, and disrupt the society and culture of Aboriginal people living near the facilities. Since the early 1970s, Hydro-Québec has been aware of the environmental externalities of its operations. The adoption of a Quebec statute on environmental quality in 1972, the cancellation of Champigny Project, a planned pumped storage plant in the Jacques-Cartier River valley in 1973, and the James Bay negotiations leading to the James Bay and Northern Quebec Agreement in 1975, forced the company to reconsider its practices. To address environmental concerns, Hydro-Québec established an environmental protection committee in 1970 and an Environmental Management unit in September 1973. Its mandate is to study and measure the environmental effects of the company, prepare impact assessment, and develop mitigation strategies for new and existing facilities, while conducting research projects in these areas, in cooperation with the scientific community. The caribou population near major reservoirs in northern Quebec has increased between 1970 and 2000. In the late 1970s, the company set up a network of 27 monitoring stations to measure the effects of the James Bay Project which provide a wealth of data on northern environments. The first 30 years of studies in the James Bay area have confirmed that mercury levels in fish increase by 3 to 6 times over the first 5 to 10 years after the flooding of a reservoir, but then gradually revert to their initial values after 20 to 30 years. These results confirm similar studies conducted elsewhere in Canada, the United States and Finland. Research also found that it is possible to reduce human exposure to mercury even when fish constitutes a significant part of a population's diet. Exposure risks can be mitigated without overly reducing the consumption of fish, simply by avoiding certain species and fishing spots. Despite the fact that the transformation of a terrestrial environment into an aquatic environment constitutes a major change and that flooding leads to the displacement or death of nonmigratory animals, the riparian environments lost through flooding are partially replaced by new ones on the exposed banks of reduced-flow rivers. The biological diversity of reservoir islands is comparable to other islands in the area and the reservoir drawdown zone is used by a variety of wildlife. The population of migratory species of interest such as the caribou have even increased to the point where the hunt has been expanded. Emissions of greenhouse gases (GHG) rise significantly for a few years after reservoir impoundment, and then stabilize after 10 years to a level similar to that of surrounding lakes. Gross GHG emissions of reservoirs in the James Bay area fluctuate around 30,000 tonnes of CO2 equivalent per TWh of generated power. Hydro-Québec claims its hydroelectric plants release 35 times less GHG than comparable gas-fired plants and 70 times less than coal-fired ones and that they constitute the "option with the best performance" overall. Of all Cree communities, Chisasibi was most affected by the James Bay hydroelectric development project Crees living on Fort George island resettled to the new village on the left bank of La Grande River in 1980-1981. Another major environmental concern relates to the population of areas affected by hydroelectric development, specifically the Innu of the North Shore and the Cree and Inuit in Northern Quebec. The hydroelectric developments of the last quarter of the 20th century have accelerated the settling process among Aboriginal populations that started in the 1950s. Among the reasons cited for the increased adoption of a sedentary lifestyle among these peoples are the establishment of Aboriginal businesses, the introduction of paid labor, and the flooding of traditional trapping and fishing lands by the new reservoirs, along with the operation of social and education services run by the communities themselves under the James Bay and Northern Quebec Agreement. Some native communities, particularly the Crees, have come to a point "where they increasingly resemble the industrialized society of the South", notes an Hydro-Québec report summarizing the research conducted in the area between 1970 and 2000. The report adds that a similar phenomenon was observed after the construction of roads and hydroelectric plants near isolated communities in northern Canada and Scandinavia. However, growing social problems and rising unemployment have followed the end of the large construction projects in the 1990s. The report concludes that future economic and social development in the area "will largely depend on the desire for cooperation among the various players". After the strong rejection of the Suroît project and its subsequent cancellation in November 2004, Hydro-Québec, under the leadership of its new CEO Thierry Vandal, reaffirmed Hydro-Québec's commitment towards energy efficiency, hydropower and development of alternative energy. Since then, Hydro-Québec regularly stresses three criteria for any new hydroelectric development undertaken by the company: projects must be cost effective, environmentally acceptable and well received by the communities. Hydro-Québec has also taken part in a series of sustainable development initiatives since the late 1980s. Its approach is based on three principles: economic development, social development and environmental protection. Since 2007 the company adheres to the Global Reporting Initiative, which governs the collection and publication of sustainability performance information. The company employs 250 professionals and managers in the environmental field and has implemented an ISO 14001-certified environmental management system. Evolution of Hydro-Québec residential rates (turquoise) and the Quebec Consumer price index (dark blue) between 1998 and 2011. At the end of 2010, Hydro-Québec served 4,060,195 customers grouped into three broad categories: residential and farm (D Rate), commercial and institutional (G Rate) and industrial (M and L rates). The Other category includes public lighting systems and municipal distribution systems. About a dozen distribution rates are set annually by the Régie de l'énergie after public hearings. Pricing is based on the cost of delivery, which includes the cost of supply and transmission, depreciation on fixed assets and provisions for the maintenance of facilities, customer growth and a profit margin. Rates are uniform throughout Quebec and are based on consumer type and volume of consumption. All rates vary in block to mitigate any cross-subsidization effect between residential, commercial and industrial customers. Hydro-Québec retail rates are among the lowest in North America. After a five-year rate freeze, between May 1, 1998 and January 1, 2004, the Régie granted rate increases on 8 occasions between 2004 and 2010 for a total of 18.4%. More recently, the regulator ordered two successive rate rollbacks in 2011 (0.4%) and 2012 (0.5%). However, rates are expected to go up by 3.7% a year from 2014 to 2018 to reflect a gradual increase of heritage pool electricity announced in the 2010 Quebec budget. Electric heating accounts for more than half of the electricity used by residential customers in Quebec, according to Hydro-Québec. The average consumption of residential and agricultural customers is relatively high, at 16,857 kWh per year in 2011, because of the widespread use of electricity as the main source of space (77%) and water heating (90%). Hydro-Québec estimates that heating accounts for more than one half of the electricity demand in the residential sector. 2 eq.) of all emissions in Quebec in 2006. Emissions from the residential sector in Quebec fell by 30% between 1990 and 2006. Residential use of electricity fluctuates from one year to another, and is strongly correlated with the weather. Contrary to the trend in neighboring networks, Hydro-Québec's system is winter-peaking. A new all-time consumption record was set on January 23, 2013 with a load of 38,910 MW. Previous records were established on January 24, 2011 with 37,717 MW, on January 16, 2009, with a load of 37,230 MW, and on January 15, 2004 when peak reached 36,268 MW. A Hydro-Québec digital power meter. The price of electricity for residences and farms includes a 40.64¢ daily subscription fee, and two price levels depending on consumption. The rates are all-included: power, transmission and distribution costs, but are subject to the Goods and Services Tax (GST) and the Quebec Sales Tax (QST). As of April 1, 2012, customers pay 5.32¢/kWh for the first 30 daily kWh, while the remainder is sold at 7.51¢/kWh. The average monthly bill for a residential customer was approximately C$100 in 2008. Electric meter readings are usually conducted every two months and bills are bimonthly. However, the company offers an optional Equalized Payment Plan allowing residential customers to pay their annual electricity costs in 12 monthly installments, based on past consumption patterns of the current customer address and the average temperature in that location. In 2007, Hydro-Québec pulled out of a Canadian government initiative to install smart meters across the province, stating that it would be "too costly to deliver real savings". Since then, Hydro-Québec organized a 2-year pilot project, involving 2,000 customers in 4 cities, with time of use metering. A report, filed with the Régie de l'énergie, in the summer of 2010 concluded that the effect of marginal cost pricing with three levels of pricing in the winter would lead to minimal load and energy savings. The company intends to gradually phase-in Advanced Metering Infrastructure (AMI) between 2011 and 2017. Early efforts will focus on meter data transfer, connect-disconnect, outage detection and theft reduction. Rio Tinto Alcan's Laterriere smelter in Saguenay. Large industrial users, especially the metallurgy and the pulp and paper industries, use 40.6% of all electricity sold in Quebec. For more than a century, industrial development in Quebec has been stimulated by the abundance of hydroelectric resources. Energy represents a significant expenditure in the pulp and paper and aluminum sectors. two industries with long-standing traditions in Quebec. In 2010, industrial customers purchased 68.4 TWh from Hydro-Québec, representing 40.4% of all electricity sold by the company on the domestic market. The Smurfit-Stone paper mill in La Tuque. The Quebec government uses low electricity rates to attract new business and consolidate existing jobs. Despite its statutory obligation to sell electric power to every person who so requests, the province has reserved the right to grant large load allocations to companies on a case by case basis since 1974. The threshold was set at 175 MW from 1987 to 2006 and was reduced to 50 MW in the government's 2006–2015 energy strategy. Large industrial users pay a lower rate than the domestic and commercial customers, because of lower distribution costs. In 2010, the largest industrial users, the Rate L customers, were paying an average of 4.66¢/kWh whereas companies with special contracts paid 3.07¢/kWh. In 1987, Hydro-Québec and the Quebec government agreed to a series of controversial deals with aluminum giants Alcan and Alcoa. These risk sharing contracts set the price of electricity based on a series of factors, including aluminum world prices and the value of the Canadian dollar Those agreements are gradually being replaced by one based on published rates. On May 10, 2007, the Quebec government signed an agreement with Alcan. The agreement, which is still in force despite the company's merger with Rio Tinto Group, renews the water rights concession on the Saguenay and Peribonka rivers. In exchange, Alcan has agreed to invest in its Quebec facilities and to maintain jobs and its corporate headquarters in Montreal. On December 19, 2008, Hydro-Québec and Alcoa signed a similar agreement. This agreement, which expires in 2040, maintains the provision of electricity to Alcoa's three aluminum smelters in the province, located in Baie-Comeau, Bécancour and Deschambault-Grondines. In addition, the deal will allow Alcoa to modernize the Baie-Comeau plant which will increase its production capacity by 110,000 tonnes a year, to a total of 548,000 tonnes. Several economists, including Université Laval's Jean-Thomas Bernard and Gérard Bélanger, have challenged the government's strategy and argue that sales to large industrial customers are very costly to the Quebec economy. In an article published in 2008, the researchers estimate that, under the current regime, a job in a new aluminum smelter or an expansion project costs the province between C$255,357 and C$729,653 a year, when taking into consideration the money that could be made by selling the excess electricity on the New York market. This argument is disputed by large industrial customers, who point out that data from 2000 to 2006 indicate that electricity exports prices get lower when quantities increase, and vice versa. "We find that the more we export, the less lucrative it gets", said Luc Boulanger, the head of the association representing Quebec's large industrial customers. In his opinion, the high volatility of electricity markets and the transmission infrastructure physical limitations reduce the quantities of electricity that can be exported when prices are higher. Hydro Quebec gained attention with Bitcoin miners in 2018 after the crackdown on mining in China. The province has an energy surplus equivalent to 10 Terawatt hours per year. Part of the electricity used in Boston comes from the remote dams in the James Bay area. Hydro-Québec sells part of its surplus electricity to neighbouring systems in Canada and the United States under long term contracts and transactions on the New England, New York and Ontario bulk energy markets. In 2017, net exports revenues were at $1,651 million for a total of 34.4 TWh sent to New-England (53%), New York (23%), Ontario (13%) and other (5%). Although most export sales are now short-term transactions, Hydro-Québec has entered into long-term export contracts in the past. The corporation has 15 interconnections to neighboring markets. In 1990, the company signed a 328-MW deal with a group of 13 electric distributors in Vermont. On March 11, 2010, Vermont's two largest utilities, Green Mountain Power and Central Vermont Public Service, entered into a tentative 26-year deal with Hydro-Québec to purchase up to 225 MW of hydro power from 2012 to 2038. The memorandum of understanding provides for a price smoothing mechanism shielding Vermont customers from market price spikes. The deal is contingent upon the enactment designating large hydro as "renewable energy". In 2015, Hydro-Quebec and the Ontario Independent Electricity System Operator (IESO) signed a 500-MW seasonal capacity sharing agreement. Ontario has increased capacity in the Winter, and shortages in the summer. Quebec has increased capacity in the summer, and shortages in the Winter. Thus, the agreement serves as to achieve an cost-effective solution for both provinces. Furthermore, in 2016 (IESO) and Hydro-Quebec signed a new long-term agreement starting in 2017 until 2023. The deal will send 2TWh per year to Ontario. On the other hand, Quebec should receive capacity from Ontario during Winter's peak demand. From 1944 to 1978, management of Hydro-Québec consisted of five commissioners, one of them acting as president. ^ This table excludes 24 thermal and 1 hydroelectric plant owned and operated by Hydro-Québec Distribution. ^ This number includes the 5,200-MW Churchill Falls lines, which have no export capability. ^ 1 TWh= 1 billion kWh. ^ Hydro-Québec. "The Board of Directors: Reflecting the diversity of our operations". Retrieved 2018-11-21. ^ Bloomberg News. "Company Overview of Hydro-Québec". Retrieved 2018-11-21. ^ a b c d e Annual Report 2015 (PDF). Hydro-Québec. Archived from the original (PDF) on 4 April 2016. Retrieved 24 March 2016. ^ a b "Quebec key to cutting New England power costs: Maine governor". ca.reuters.com. Retrieved 2016-03-15. ^ "Hydro-Québec at a Glance | Who Are We? | Hydro-Québec". www.hydroquebec.com. Archived from the original on 2016-03-07. Retrieved 2016-03-15. ^ "Hydro-Québec Logo - Design and History of Hydro-Québec Logo". www.famouslogos.us. Retrieved 2016-03-26. ^ a b Latouche, Daniel. "Adélard Godbout". The Canadian Encyclopedia. Retrieved 2016-03-26. ^ "1945-1959 – Hydro-Québec's First Triumphs | History of Electricity in Québec | Hydro-Québec". www.hydroquebec.com. Retrieved 2016-03-26. ^ Jobin, Carol (1978). Les enjeux économiques de la nationalisation de l'électricité (1962–1963). Montreal: Éditions coopératives Albert Saint-Martin. p. 29. ^ Boyd, Robert (1995). Hydro-Québec : autres temps, autres défis. Sainte-Foy, Québec: Presses de l'Université du Québec. pp. 97–103. ISBN 2-7605-0809-9. ^ Turgeon 1992, p. 110. ^ "1960-1979 – The Second Nationalization | History of electricity in Quebec | Hydro-Québec". www.hydroquebec.com. Retrieved 2016-03-26. ^ Sood, Vijay K. (Spring 2006). "IEEE Milestone : 40th Anniversary of 735 kV Transmission System" (PDF). IEEE Canadian Review: 6–7. Retrieved 2009-03-14. ^ "Hydro-Québec". Historica Canada. Retrieved 27 March 2016. ^ "Speaking notes from an address by Brian Tobin". Premier's Address on Churchill Falls to the Empire Club, Toronto. Government of Newfoundland and Labrador. November 19, 1996. Retrieved June 9, 2010. ^ "1980-1996 – A Time of Uncertainty | History of Electricity in Québec | Hydro-Québec". www.hydroquebec.com. Retrieved 2016-03-28. ^ International Energy Agency 2004, p. 127. ^ "1997-… – Renewed Growth | History of electricity in Québec | | Hydro-Québec". www.hydroquebec.com. Retrieved 2016-03-28. ^ "Société d'énergie de la Baie James". www.hydroquebec.com. Retrieved 2016-03-28. ^ "Hydroelectric generating stations | Hydro-Québec Production". www.hydroquebec.com. Retrieved 2016-03-28. ^ Hydro-Quebec (14 November 2001). "Annual Report 2017" (PDF). 133 (46). Quebec City: Hydro-Quebec. pp. 7705–7725. Retrieved 2018-10-11. ^ National Assembly of Quebec. "An Act respecting the Régie de l'énergie, R.S.Q. c. R-6.01". Retrieved 2009-03-14. ^ Hydro-Québec Distribution (16 December 2008). "Respect du critère de fiabilité en puissance - bilan du Distributeur pour l'année 2008-2009" (PDF). Régie de l'énergie du Québec. p. 12. Retrieved 2009-03-27. ^ Government of Quebec (14 November 2001). "Décret 1277-2001 du 24 octobre 2001 concernant les caractéristiques de l'approvisionnement des marchés québécois en électricité patrimoniale" (PDF). Gazette officielle du Québec (in French). 133 (46). Quebec City: Government of Quebec. pp. 7705–7725. Retrieved 2009-10-24. ^ Hydro-Québec 2012a, p. 95. ^ a b c d Hydro-Québec (April 2008). 2007 Annual Report : Green Energy (PDF). Montreal. p. 124. ISBN 978-2-550-52014-6. ^ a b Hydro-Québec (2003). Annual Report 2002 : Energy is Our Business (PDF). Montreal: Hydro-Québec. p. 115. ISBN 2-550-40534-X. Archived from the original (PDF) on 2004-04-07. Retrieved 2010-01-10. ^ Hydro-Québec. Annual Report 2013 (PDF). Montreal: Hydro-Québec. p. 124. Retrieved 2018-10-14. ^ Hydro-Québec. Annual Report 2015 (PDF). Montreal: Hydro-Québec. p. 124. Retrieved 2018-10-14. ^ Hydro-Québec. Annual Report 2016 (PDF). Montreal: Hydro-Québec. p. 124. Retrieved 2018-10-14. ^ Hydro-Québec. Annual Report 2017 (PDF). Montreal: Hydro-Québec. p. 124. Retrieved 2018-10-14. ^ Hydro-Québec 2011a, p. 90. ^ Bolduc 2000, p. 245. ^ Boyer, Marcel; Garcia, Claude (August 2007). "Privatising Hydro-Québec : An idea worth exploring" (PDF). Montreal Economic Institute. Retrieved 2009-05-05. ^ Radio-Canada (8 November 2008). "Faut-il privatiser Hydro ?". Québec 2008 (in French). Retrieved 2009-03-18. ^ Léger Marketing (10 November 2008). "Léger Marketing / Journal de Montréal / TVA / The Gazette Poll- Analysis Report" (PDF). Archived from the original (PDF) on 27 March 2009. Retrieved 2009-11-23. ^ Lepage, Guy A. (16 November 2008). "Tout le monde en parle (interview)". Radio-Canada. Retrieved 2009-04-11. ^ Lessard, Denis (4 February 2009). "Privatisation d'Hydro : " pas dans les cartons du gouvernement "". La Presse (in French). Montreal. Retrieved 2009-03-19. ^ Fortin, Pierre (15 September 2008). "Vive l'électricité plus chère !". L'actualité (in French). Archived from the original on 8 December 2009. Retrieved 2010-01-07. ^ Bernard, Jean-Thomas (April 2005). "Le marché québécois de l'électricité : à la croisée des chemins" (PDF). Groupe de recherche en économie de l'énergie, de l'environnement et des ressources naturelles (GREEN). Université Laval. p. 17. Archived from the original (PDF) on 2011-07-06. Retrieved 2009-04-11. ^ Allaire, Yvan (10 September 2007). "Privatiser Hydro-Québec ?". Le Devoir (in French). Montreal. Retrieved 2010-01-07. ^ Tremblay, Bertrand (10 March 2009). "Non à la privatisation". Le Quotidien (in French). Retrieved 2010-01-07. ^ Lauzon, Léo Paul (1994). "Continuer à privatiser Hydro-Québec, ou consolider ses opérations" (PDF). Archived from the original (PDF) on 2011-07-06. Retrieved 2009-03-18. ^ Sainte-Marie, Gabriel (27 February 2009). "Vendre Hydro ne règle rien". Le Soleil (in French). Retrieved 2009-03-18. ^ a b Hydro-Qubébec (2014). "Hydro-Québec's electricity facts: Energy Supplies and Air Emissions" (PDF). Archived from the original (PDF) on 2016-03-06. Retrieved May 18, 2014. ^ Hydro-Québec 2011a, p. 8. ^ Government of Quebec 2002, p. ?. ^ Hydro-Québec. "Discover our Hydroelectric Facilities". Archived from the original on 2008-03-17. Retrieved 2009-05-06. ^ CBC News (3 October 2012). "Quebec nuclear reactor shutdown will cost $1.8 billion". Canadian Broadcasting Corporation. Retrieved 4 October 2012. ^ Grégoire-Racicot, Louise (November 4, 2011). "Sorel-Tracy: Hydro-Québec ferme la centrale thermique". La Voix (in French). Sorel-Tracy, Quebec. Archived from the original on March 18, 2014. Retrieved January 15, 2013. ^ a b Hydro-Québec 2012a, p. 114. ^ Hydro-Québec 2011a, p. 12. ^ Hydro-Québec 2011a, p. 92. ^ Hydro-Québec 2010a, p. 10. ^ Hafsi 2001, pp. 561–562. ^ a b Fairley, Peter (April 2005). "TransÉnergie : Playing Two Power Games". Technology Review. Retrieved 2009-03-21. ^ Hydro-Québec TransÉnergie. "Discover Hydro-Québec TransÉnergie and its system - Profile". Archived from the original on 2009-08-03. Retrieved 2009-03-14. ^ Dutrisac, Robert (3 April 2009). "Nouvelle entente avec Hydro-Québec - Terre-Neuve vendra son électricité directement aux Américains". Le Devoir (in French). Montreal. Retrieved 2009-04-03. ^ Lessard, Denis (3 April 2009). "Fragile entente avec Terre-Neuve sur Churchill Falls". La Presse (in French). Montreal. Archived from the original on 6 April 2009. Retrieved 2009-04-03. ^ Reliability Coordinator for Québec. "Reliability Functional Model for North America". Hydro-Québec TransÉnergie. Archived from the original on 2011-06-05. Retrieved 2009-03-20. ^ Hydro-Québec 2012a, p. 14. ^ Hydro-Québec TransÉnergie. "Hydro-Québec TransÉnergie". Retrieved 2012-03-29. ^ a b Hydro-Québec (June 2007). "315/230-kV Outaouais Substation - Start of Work" (PDF). Archived from the original (PDF) on 2008-11-20. Retrieved 2009-03-20. ^ U.S.-Canada Power System Outage Task Force (April 2004). "6. The Cascade Stage of the Blackout". Final Report on the August 14, 2003 Blackout in the United States and Canada : Causes and Recommendations (PDF). Washington, DC & Ottawa. p. 93. Retrieved 2009-03-20. ^ Hydro-Québec TransÉnergie. "Discover Hydro-Québec TransÉnergie and its system - Features of Our Transmission System". Archived from the original on 2007-11-02. Retrieved 2009-03-14. ^ Hydro-Québec 2012a, p. 15. ^ Northern Pass Transmission (2010). "Route Information". Northern Pass Transmission LLC. Archived from the original on 2010-12-20. Retrieved 2010-10-13. ^ Dillon, John (8 October 2010). "New Transmission Line Reaches Milestone". Vermont Public Radio. Retrieved 2010-10-12. ^ Alspach, Kyle (5 October 2010). "NStar to build hydro power line". Boston Business Journal. Retrieved 2010-10-12. ^ Penty, Rebecca (14 November 2009). "U.S. calls power line a landmark investment". Telegraph-Journal. Saint John, NB. p. C1. Retrieved 2009-11-14. ^ Hydro-Québec 2011a, p. 20. ^ Association des redistributeurs d'électricité du Québec. "Membres de l'AREQ" (in French). Archived from the original on 2009-06-20. Retrieved 2009-03-14. ^ Hydro-Québec Distribution. "Electricity Supply Contracts by Technology". Archived from the original on 2008-11-20. Retrieved 2009-03-15. ^ Hydro-Québec 2011a, p. 32. ^ Hydro-Québec Technologie. "Hydro-Québec Research Institute". Retrieved 2009-05-16. ^ Hydro-Québec Technologie. "Our Innovation Avenues". Archived from the original on 2008-07-04. Retrieved 2009-05-06. ^ Ouellet, Danielle; Fortier, Alain (Winter 1993–1994). "Hydro-Québec and its partners in research and development". Forces (104). pp. 31–33. ISSN 0015-6957. ^ Hydro-Québec Technologie. "Energy Technology Laboratory (LTE)". Archived from the original on 2009-05-30. Retrieved 2009-03-18. ^ Templier, Sébastien (16 October 2009). "Moteur électrique: percée majeure chez Hydro-Québec". La Presse (in French). Montreal. Archived from the original on 3 December 2009. Retrieved 2009-11-18. ^ Hydro-Québec 2011a, p. 36–37. ^ Cardinal, François (19 November 2008). "Une batterie dans les cartons d'Hydro-Québec". La Presse (in French). Montreal. Archived from the original on 6 July 2011. Retrieved 2009-03-28. ^ Lavallée, Pierre (15 April 2003). "Pourrait-on construire une voiture électrique au Québec?". 5 sur 5 (in French). Radio-Canada. Event occurs at 0:09:30. Archived from the original on 3 April 2009. ^ Francoeur, Louis-Gilles (15 January 2008). "Volvo sur les traces d'Hydro". Le Devoir (in French). Montreal. Retrieved 2010-01-07. ^ Provost, Gilles; Gélinas, Pascal (9 March 1997). "La Voiture électrique d'Hydro". Découverte (in French). Radio-Canada. Retrieved 2009-03-30. ^ TM4 Electrodynamic Systems. "History". Archived from the original on 2010-03-09. Retrieved 2010-10-09. ^ Radio-Canada (22 September 2006). "Voiture électrique: Moteur québécois, fabrication étrangère ?" (in French). Retrieved 2009-03-18. ^ Hydro-Québec (15 January 2009). "TM4 partners with Tata Motors and Miljø in electric vehicle demonstration project". Retrieved 2009-05-06. ^ Francoeur, Louis-Gilles (16 January 2009). "Hydro-Québec est en voiture". Le Devoir (in French). Montreal. Retrieved 2009-01-07. ^ Hydro-Québec (13 May 2009). "The Romaine Hydroelectric Complex - Premier Charest launches largest construction project in Canada". CNW Group. Retrieved 2009-05-13. ^ Hydro-Québec. "Projet du complexe de la Romaine. En bref" (in French). Retrieved 2009-03-14. ^ Francoeur, Louis-Gilles (11 March 2009). "Une autre rivière à harnacher dans la mire de Jean Charest". Le Devoir (in French). Montreal. Retrieved 2010-01-07. ^ Hydro-Québec 2009a, p. 19. ^ Cloutier 1984, pp. 172–174. ^ Hydro-Québec (16 June 2006). "Transelec Chile: Hydro-Québec sells its stake for C$1.7 billion" (Press release). Retrieved 2010-01-07. ^ "Enel acquires joint stake in Fortuna". Business News America. 4 August 2006. Retrieved 2010-01-07. ^ a b Hydro-Québec (2000). Annual Report 1999 : All our energy for you (PDF). Montreal: Hydro-Québec. p. 102. ISBN 2-550-35575-X. Archived from the original (PDF) on 2004-04-07. Retrieved 2010-01-10. ^ Société nationale d'électricité du Sénégal. "Histoire" (in French). Retrieved 2009-03-14. ^ Hydro-Québec (30 July 2004). "Hydro-Québec International Sells its Stake in Meiya Power Company Limited of China for US$84.6 Million". Retrieved 2010-01-07. ^ Presse canadienne (19 May 2006). "Il y a un peu d'Hydro-Québec dans le barrage des Trois Gorges". Le Soleil (in French). ^ Dutrisac, Robert (24 October 2006). "Un milliard au Fonds des générations". Le Devoir (in French). Montreal. Retrieved 2010-01-07. ^ Hydro-Québec (2003). "8- Fish Communities" (PDF). La Grande Hydroelectric Complex. Hydro-Québec. Archived from the original (PDF) on 2008-12-02. Retrieved 2009-03-23. ^ Hydro-Québec. "The Issue of Mercury for Hydro-Québec". Archived from the original on 2008-09-05. Retrieved 2009-03-22. ^ a b c Hydro-Québec. "Greenhouse Gas Emissions and Hydroelectric Reservoirs". Archived from the original on 2009-08-03. Retrieved 2009-05-06. ^ Dubeau 1995, p. 242. ^ Dubeau 1995, p. 241. ^ a b c d Hayeur 2001, p. 110. ^ Dubeau 1995, p. 243. ^ a b c Hayeur 2001, p. 89. ^ Gagnon, Luc (January 2003). "Comparing Power Generation Options" (PDF). Hydro-Québec. p. 8. Archived from the original (PDF) on 2009-09-20. Retrieved 2009-05-06. ^ Vandal 2005, p. 236. ^ Hydro-Québec. "Our Integrated Approach: Defining Sustainable Development". Archived from the original on 2009-04-22. Retrieved 2009-05-06. ^ Hydro-Québec. "Adhering to the Global Reporting Initiative (GRI) Guidelines: Summary". Archived from the original on 2009-03-30. Retrieved 2009-05-06. ^ Hydro-Québec (2008). Sustainability Report 2007: Sustainable Energy (PDF). Montreal. p. 44. ISBN 978-2-550-52018-4. ^ a b c Hydro-Québec 2012a, p. 96. ^ "Fitch Rates Hydro-Quebec's US$3B Medium-Term Note Program 'AA-'; Outlook Stable" (Press release). Fitch Ratings. 31 January 2012. Retrieved 2012-03-11. ^ Hydro-Québec (2003). Strategic Plan 2004-2008 (PDF). Montreal: Hydro-Québec. p. 220. ISBN 2-550-41592-2. ^ Bourque, Olivier (3 August 2010). "Pas de hausse de tarifs pour Hydro l'an prochain". Argent (in French). Archived from the original on 4 June 2012. Retrieved 2012-03-11. ^ Moore, Lynn (9 March 2012). "Hydro-Québec ordered to roll back its rates". Global Montreal. Retrieved 2012-03-11. ^ Hydro-Québec 2012b, p. 14. ^ Hydro-Québec. "Factors that Influence your Consumption". Hydro-Québec. Archived from the original on 2012-12-20. Retrieved 2010-01-07. ^ Government of Quebec (November 2008). "Inventaire québécois des émissions de gaz à effet de serre en 2006 et évolution depuis 1990" (PDF) (in French). Quebec Department of Sustainable Development, Environment and Parks. Archived from the original (PDF) on 2011-06-16. Retrieved 2009-03-19. ^ CBC News (January 23, 2013). "Quebec hits all-time high for power consumption during cold snap". CBC.ca. Retrieved January 23, 2013. ^ Hydro-Québec 2010a, p. 20. ^ "Vague de froid: Hydro prévoit une pointe de consommation historique". Le Soleil (in French). Quebec City. 23 January 2011. Retrieved 2011-01-23. ^ Bélair-Cirino, Marco (16 January 2009). "Froid sibérien - Le réseau d'Hydro poussé à son extrême limite". Le Devoir (in French). Montreal. Retrieved 2010-01-07. ^ Hydro-Québec. "Regular bill". Retrieved 2010-09-04. ^ Hydro-Québec (April 2012). "Rate D – Domestic rate (residential and farms)". Retrieved 2012-05-09. ^ Régie de l'énergie du Québec (6 March 2009). "La Régie de l'énergie rend sa décision relative à la demande de modifier les tarifs d'Hydro-Québec dans ses activités de distribution, en appliquant une hausse tarifaire de 1,2 % à compter du 1er avril 2009" (PDF) (in French). Retrieved 2009-03-18. ^ Hydro-Québec Distribution. "Equalized Payments Plan and Authorized Payment". Archived from the original on 2009-04-29. Retrieved 2009-05-06. ^ CBC News (10 December 2007). "Hydro Quebec shelves smart meters". Canadian Broadcasting Corporation. Retrieved 2009-05-06. ^ Hydro-Québec Distribution (2 August 2010). "HQD-12, Document 6 – Rapport final du Projet Tarifaire Heure Juste" (PDF) (in French). Régie de l'énergie du Québec. Retrieved 2011-01-17. ^ Wright, Kristen (December 2010). "Electric Light & Power 2010 Utility of the Year: Hydro-Quebec". Electric Light & Power. 88 (6). Retrieved 2011-01-17. ^ Hydro-Québec 2011a, p. 97. ^ Régie de l'énergie du Québec (30 May 2005). Avis de la Régie de l'énergie sur la distribution d’électricité aux grands consommateurs industriels (A-2005-01) (PDF) (in French). Montreal. p. 96. ^ Government of Quebec 2006, p. 24. ^ Hydro-Québec Distribution (May 20, 2011). "Rapport annuel 2010: HQD-10, document 2 - Historique des ventes, des produits des ventes, des abonnements et de la consommation" (PDF) (in French). p. 10. Retrieved March 9, 2012. ^ Couture, Pierre (28 August 2008). "Les alumineries coûtent cher à Hydro-Québec : plus de 3 milliards $". Le Soleil (in French). Quebec City. Retrieved 2009-03-18. ^ Presse canadienne (20 December 2008). "Alcoa et Hydro-Québec ont renouvelé des ententes jusqu'en 2040". Le Devoir (in French). Montreal. Retrieved 2010-01-07. ^ Bélanger & Bernard 2008. ^ a b Lampert, Allison (12 January 2018). "Chinese bitcoin miners eye sites in energy-rich Canada". Reuters. Retrieved 14 January 2018. ^ Hydro-Québec 2012a, p. 97. ^ Hydro-Québec. Annual Report 2017 (PDF). Hydro-Québec. p. 124. Retrieved 2018-10-14. ^ "Hydro-Québec: North America's leading provider of clean energy" (Press release). Hydro-Québec. 2018-10-14. ^ "Exchange with Ontario" (Press release). Hydro-Québec. 2018-10-14. ^ "Liste des Présidents d'Hydro-Québec" (in French). Archambault, Jean-Jacques (1984). "Une technologie maîtrisée". In Couture, Marcel (ed.). Hydro-Québec: Des premiers défis à l'aube de l'an 2000 (in French). Montreal: Forces/Libre expression. pp. 125–137. ISBN 2-89111-191-5. Bélanger, Michel (1995). "Les actions d'Hydo-Québec à vendre ?". In Bélanger, Yves; Comeau, Robert (eds.). Hydro-Québec : Autres temps, autres défis. Sainte-Foy: Presses de l'Université du Québec. pp. 89–95. ISBN 2-7605-0809-9. Bellavance, Claude (1995). "Un long mouvement d'appropriation de la première à la seconde nationalisation". In Bélanger, Yves; Comeau, Robert (eds.). Hydro-Québec : Autres temps, autres défis (in French). Sainte-Foy, Quebec: Presses de l'Université du Québec. pp. 71–78. ISBN 2-7605-0809-9. Bolduc, André (2000). Du génie au pouvoir : Robert A. Boyd, à la gouverne d'Hydro-Québec aux years glorieuses (in French). Montreal: Libre-Expression. ISBN 2-89111-829-4. .
Government of Quebec (2006). Using energy to build the Québec of tomorrow (PDF). Quebec City: Quebec Department of Natural Ressources and Wildlife. ISBN 2-550-46952-6. Archived from the original (PDF) on 2011-07-20. Bolduc, André; Hogue, Clarence; Larouche, Daniel (1989). Hydro-Québec After 100 Years of Electricity (in French). Montreal: Libre-Expression. Boutin, Vicky (2004). "La saga du Suroît". In Venne, Michel (ed.). L'annuaire du Québec 2005 (in French). Montreal: Fides. pp. 554–557. ISBN 2-7621-2568-5. Boyd, Robert A. (1995). "Cinquante ans au service du consommateur". In Bélanger, Yves; Comeau, Robert (eds.). Hydro-Québec : Autres temps, autres défis (in French). Sainte-Foy, Quebec: Presses de l'Université du Québec. pp. 97–103. ISBN 2-7605-0809-9. Bureau d'audiences publiques sur l'environnement (2000). Rapport 144. Ligne à 735 kV Saint-Césaire–Hertel et poste de la Montérégie (PDF) (in French). Quebec City: Bureau d'audiences publiques sur l'environnement. p. 111. ISBN 2-550-36846-0. Cloutier, Gilles-G. (1984). "Le rayonnement d'Hydro-Québec". In Couture, Marcel (ed.). Hydro-Québec: Des premiers défis à l'aube de l'an 2000 (in French). Montreal: Forces/Libre expression. pp. 166–175. ISBN 2-89111-191-5. Dubeau, Daniel (1995). "Le souci constant de l'environnement chez Hydro-Québec". In Bélanger, Yves; Comeau, Robert (eds.). Hydro-Québec : Autres temps, autres défis. Sainte-Foy: Presses de l'Université du Québec. pp. 241–254. ISBN 2-7605-0809-9. Fleury, Jean Louis (1999). Les coureurs de lignes : l'histoire du transport de l'électricité au Québec (in French). Montreal: Stanké. ISBN 2-7604-0552-4. .
Gallichan, Gilles (1995). "De la Montreal Light, Heat and Power à Hydro-Québec". In Bélanger, Yves; Comeau, Robert (eds.). Hydro-Québec : Autres temps, autres défis (in French). Sainte-Foy: Presses de l'Université du Québec. pp. 63–70. ISBN 2-7605-0809-9. Garcia, Claude (February 2009). How would the privatisation of Hydro-Québec would make Quebecers richer ? (PDF). Montreal Economic Institute. ISBN 2-922687-25-2. Retrieved 2009-05-05. Government of Quebec (2002). Water. Our Life. Our Future. Quebec Water Policy (PDF). Quebec City: Quebec Department of Sustainable Development, the Environment and Parks. ISBN 2-550-40076-3. Gravel, Pierre; Vennat, Pierre (1979). "Robert Bourassa : « Il ne sera pas dit que nous vivrons pauvrement sur une terre aussi riche »". In Leroux, Roger (ed.). La Baie James : projet du siècle (in French). Montreal: La Presse. pp. 5–6. International Energy Agency (2004). Canada : 2004 Review (PDF). Energy Policies of IEA Countries. Paris: International Energy Agency. p. 127. ISBN 92-64-10801-7. Archived from the original (PDF) on 2018-01-31. Retrieved 2019-01-01. Jobin, Carol (1978). Les enjeux économiques de la nationalisation de l'électricité (1962–1963) (in French). Montreal: Éditions coopératives Albert Saint-Martin. Nalcor Energy (2009). Annual Report 2008 (PDF). St. John's, NL. ISBN 978-2-550-55046-4. Archived from the original (PDF) on 2011-07-14. Norrie, Kenneth; Owram, Douglas; Emery, J.C. Herbert (2008). A History of the Canadian Economy (4th ed.). Toronto: Nelson. ISBN 978-0-17-625250-2. North American Reliability Corporation (November 2008). 2008/2009 Winter Reliability Assessment (PDF). Princeton, NJ. Archived from the original (PDF) on 2012-02-18. Retrieved 2012-03-03. Quebec Hydroelectric Commission; Churchill Falls (Labrador) Corporation Limited (1969). "Power Contract Between the Quebec Hydroelectric Commission and the Churchill Falls (Labrador) Corporation" (PDF). Montreal: archive.org. Retrieved 2009-12-02. Régie de l'énergie du Québec (2008). 2007-2008 Annual Report. Montréal. p. 4. ISBN 978-2-550-53010-7. Savard, Stéphane (2013). Hydro-Québec et l'état québécois: 1944-2005 (in French). Quebec City: Septentrion. ISBN 978-2-89448-756-3. Smith, Philip (1975). Brinco: The story of Churchill Falls. Toronto: McClelland and Stewart. p. 372. ISBN 0-7710-8184-7. Société d'énergie de la Baie James (1987). Complexe hydroélectrique de la Grande-Rivière. Réalisation de la première phase (in French). Montreal: Société d'énergie de la Baie James/Éditions de la Chenelière. ISBN 2-89310-010-4. Trabandt, Charles A. (14 January 2000). Le tarif de fourniture d'électricité au Québec et les options possibles pour introduire la concurrence dans la production d'électricité (in French). New York: Merrill Lynch. Turgeon, Pierre (1992). La Radissonie, le pays de la baie James (in French). Montreal: Libre-Expression. ISBN 2-89111-502-3. Vandal, Thierry (2005). "Le défi du développement durable". In Venne, Michel; Robitaille, Antoine (eds.). L'annuaire du Québec 2006 (in French). Montreal: Fides. pp. 236–240. ISBN 2-7621-2646-0. Williams, Susan (1993). Hydro-Québec and the Great Whale Project Hydroelectric Development in Northern Québec. Washington, D.C.: Investor Responsibility Research Center. ISBN 1-879775-15-8. Bélanger, Gérard; Bernard, Jean-Thomas (April 2008). "Coût économique de l'électricité vendue aux nouvelles alumineries" (PDF). Policy Options (in French). 29 (4): 56–58. ISSN 0226-5893. Archived from the original (PDF) on 2009-02-19. Retrieved 2009-03-15. Bernard, Jean-Thomas; Genest-Laplante, Éric; Laplante, Benoit (1992). "Le coût d'abandonner le projet Grande-Baleine" (PDF). Canadian Public Policy (in French). 18 (2): 153–167. doi:10.2307/3551421. Retrieved 2009-03-16. Boulanger, André (April 2008). "Politique hydro-électrique et développement régional" (PDF). Policy Options (in French). 29 (4): 59–62. ISSN 0226-5893. Archived from the original (PDF) on 2009-02-19. Retrieved 2009-03-15. Hafsi, Taieb (2001). "Fundamental Dynamics in Complex Organizational Change: A Longitudinal Inquiry into Hydro-Québec's Management". Long Range Planning. 34 (5): 557–583. doi:10.1016/S0024-6301(01)00082-6. Langford, Martha Whitney; Debresson, Chris (1992). "The Role of Hydro Quebec in the Rise of Consulting Engineering in Montreal 1944-1992: An essay in oral history and company genealogy" (PDF). Scientia Canadensis: Canadian Journal of the History of Science, Technology and Medicine. 16 (1, (42)): 76–108. Retrieved 2010-01-04. McNaughton, W.J.W. (April 1960). "Bersimis: The Development of a River". Canadian Geographical Journal. Ottawa: Royal Canadian Geographical Society. 60 (4): 114–135. Powers, John M. (2007). "Profile - Thierry Vandal, President and CEO of Hydro-Québec". Electric Light and Power. 85 (4). p. 28. Hydro-Québec (2018a). Annual Report 2017 (PDF). Montreal. ISBN 978-2-550-66872-5. Retrieved 2018-10-11. Hydro-Québec (2017a). Annual Report 2016 (PDF). Montreal. ISBN 978-2-550-66872-5. Retrieved 2018-10-11. Hydro-Québec (2016a). Annual Report 2015 (PDF). Montreal. ISBN 978-2-550-66872-5. Retrieved 2018-10-11. Hydro-Québec (2015a). Annual Report 2014 (PDF). Montreal. ISBN 978-2-550-66872-5. Retrieved 2018-10-11. Hydro-Québec (2014a). Annual Report 2013 (PDF). Montreal. ISBN 978-2-550-66872-5. Retrieved 2018-10-11. Hydro-Québec (2013a). Annual Report 2012 (PDF). Montreal. ISBN 978-2-550-66872-5. ISSN 0702-6706. Retrieved 2013-07-11. Hydro-Québec (2012a). Annual Report 2011 (PDF). Montreal. ISBN 978-2-550-63872-8. ISSN 0702-6706. Retrieved 2011-03-28. Hydro-Québec (2011a). Annual Report 2010 (PDF). Montreal. ISBN 978-2-550-60869-1. ISSN 0702-6706. Archived from the original (PDF) on 2011-06-05. Retrieved 2011-03-23. Hydro-Québec (2010a). Shaping The Future : Annual Report 2009 (PDF). Montreal. ISBN 978-2-550-58101-7. ISSN 0702-6706. Retrieved 2010-04-08. Hydro-Québec (2012b). Sustainability Report 2011 (PDF). Montreal. ISBN 978-2-550-63876-6. Retrieved 2012-05-07. Hydro-Québec (March 2012c). Financial Profile 2011-2012 (PDF). Montreal. ISBN 978-2-550-63884-1. ISSN 0821-1760. Retrieved 2012-03-29. Hydro-Québec (October 2011d). Comparison of Electricity Prices in Major North American Cities: Rates effective April 1, 2011 (PDF). Montreal. ISBN 978-2-550-62677-0. Retrieved 2012-03-11. Hydro-Québec (July 2009a). Strategic Plan 2009–2013: Energy efficiency, renewable energies and technological innovation (PDF). Montreal. ISBN 978-2-550-56207-8. Retrieved 2010-01-10. Hydro-Québec (July 2009b). Sustainable Development Action Plan 2009–2013 (PDF). Montreal. ISBN 978-2-550-55279-6. Retrieved 2010-01-10. Hydro-Québec TransÉnergie. Installations de transport d’énergie au Québec (PDF) (Map) (August 2006 ed.). 1:1,500,000 (in French). Hydro-Québec. Retrieved 2010-08-14. Hayeur, Gaëtan (2001). Summary of Knowledge Acquired in Northern Environments from 1970 to 2000 (PDF). Montreal: Hydro-Québec. ISBN 2-550-36964-5. Archived from the original (PDF) on 2012-03-26. Retrieved 2011-06-25. Wikimedia Commons has media related to Hydro-Québec.